Yesterday's Master Class at Juilliard was somewhat of a departure from the typical master class for singers. 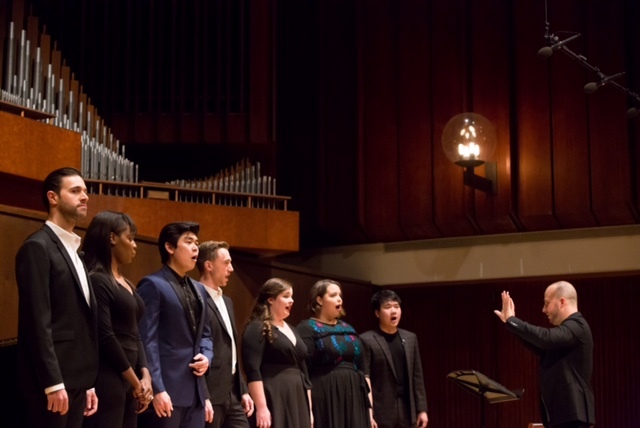 The audience was welcomed by Brian Zeger, Artistic Director of the Vocal Arts Department. He prepared observers by saying that this would not be a one-on-one event with an individual getting coaching on a prepared aria. It would be a renowned conductor (Music Director elect of the Metropolitan Opera) teaching Juilliard Singers how to perform in an ensemble. The Maestro is a highly engaging presence, filled with humor as well as prodigious artistic knowledge and experience; it was deeply satisfying to witness how the students trusted his judgment and followed his suggestions. The highlight of the class was the septet from Act I of Mozart's Don Giovanni. This highly elaborate piece of writing makes different demands on each singer. Each character has a different intention. Donna Anna (soprano Meghan Kasanders) and her intended Don Ottavio (tenor John Chongyoon Noh) are praying for divine protection in "Protegga il giusto cielo". The maestro suggested more direction from Ms. Kasanders. Donna Elvira (soprano Kathryn Henry) needed more "fire". The rapid-fire duet between Don Giovanni (baritone Dominik Belavy) and Leporello (bass William Guanbo Su--being reviewed for the third time this week!) was greatly improved when the two of them got in rhythm and in tune with each other. Zerlina (soprano Onadek Winan) needed to exhibit repressed anger. Masetto (baritone Jacob Scharfman) was helped to get into character and coached to put different colors and emphasis on the repeated "Va bene!". We confess that we were happy with the first run through but after hearing the improvements we were thrilled. The gifted pianist Michal Biel can always be counted on to accompany skillfully. We also got to hear two different singers perform the roles of Donna Anna and Don Ottavio in their first act duet "Ma qual mai s'offre oh Dei...Fuggi crudele, fuggi". Their voices were magnificent! They were coached to trust Mozart's dynamics (didn't we just hear that at last night's master class?). Jinhee Park did her customary fine accompaniment on the piano. Subtle changes can make a big difference and we agree with the maestro that the singer must draw people in. Much of the work was on using the breath to amplify the gestures. Used judiciously, it can be used to highlight emotional breathlessness. We also enjoyed the coaching for the marriage scene from Gounod's Roméo et Juliette. Soprano Tamara Banješević was encoouraged to be an excited 14 year old girl. The entire scene needed to be more intimate and less "ceremonial". Vocal colors were encouraged to avoid a "four square" sound. Too many singers establish a color and then abandon it too soon. Bass Alex Rosen made a fine Friar Lawrence and tenor James Ley did well as Roméo with mezzo-soprano Myka Murphy portraying Gertrude. Art Williford accompanied beautifully. The class closed with some questions from the audience and some general remarks from the maestro about how exceptional vocal and language preparation allows the singer the freedom to personalize his/her performance. The result is the alignment of heart and mind. We couldn't agree more!